The simple answer is this: We wrote them all as stand-alone books, so any order will work. However, we know as readers ourselves that this probably would not have satisfied us, so here is the more detailed answer. Beyond the Deepwoods was published back in 1998. At that time, we hadn’t planned a follow-up, but because we enjoyed writing it so much, we decided to turn it into a trilogy, and wrote two more books about Twig; Stormchaser (1999) and Midnight over Sanctaphrax (2000). These three books became the Twig Saga. We then wanted to write more about Sanctaphrax, but as Anchor Chain had been cut and the city had floated away, we had to go back in time to when Quint was a youth. This book became The Curse of the Gloamglozer (2001). At this point, we thought a five-book series would be fun, and as we wanted to discover what happened to Twig, we jumped forward in time and wrote The Last of the Sky Pirates (2002). However, because Twig was by this time an old man – and no one wants to read about old men! – we introduced his grandson, Rook. As a character, we liked Rook, so we decided to write two more books about his adventures: Vox (2003) and Freeglader (2004). These three books became the Rook Saga. So, Twig and Rook had three-book sagas each, but Quint only had one book about him. This seemed very unfair, so we went back in time again and wrote two more books about him: The Winter Knights (2005) and Clash of the Sky Galleons (2006). And so, at last, we also had the Quint Saga. With the nine books all written, it now makes more sense to read them in the proper chronological order, starting with Quint, continuing with Twig and ending with Rook. If we hadn’t written them differently, this is the order we’d read them in! 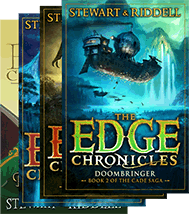 Then, following these nine books, we decided to write a tenth book in the series, which we thought would tie up all the loose ends, and conclude the Edge Chronicles for ever. We called it the Nate Saga and it was published not as three books but in one (big) volume. But we still couldn’t quite leave the Edge world, so wrote a fifth and final saga, which is set shortly after the end of The Immortals. It is about Nate’s nephew, Cade Quarter, and his adventures. In 2001, we wrote an Edge story for World Book Day in the UK called Cloud Wolf. It is about Quint, and describes an incident that he and his father had just before the start of the Curse of the Gloamglozer. Then in 2006, we wrote another Edge story for World Book Day. This one was called The Stone Pilot and gives the background story to a character we had already met, Maugin. Later, we wrote two more stories for the UK publishers. Both of them filled in gaps between the longer sagas. The Slaughterer’s Quest is about Keris, Twig’s daughter/Rook’s mother, and links the Twig and Rook sagas. While at the end of The Blooding of Rufus Filatine, someone finally manages to unleash the power of stormphrax safely, thus ushering in the Third Age of Flight. This story links the Rook and Nate Sagas. All four stories were published together as The Lost Barkscrolls. Unfortunately, this book is no longer in print. The four stories have now been included in the four most recent UK editions of the original books. Cloud Wolf is now the first five chapters of The Curse of the Gloamglozer. The Stone Pilot is at the end of Midnight over Sanctaphrax. The Slaughterer’s Quest is at the end of The Last of the Sky Pirates. The Blooding of Rufus Filatine is at the end of Freeglader.